RVers don’t usually plan our trips around thunderstorms or other bad weather. If we knew we’d be spending our vacations taking cover, most likely we’d reschedule our trips. But storms occur throughout the year in just about every place in the world, so they are a fact we simply have to accept. And accepting the fact of storms should prompt us to prepare for how storms can affect us when we’re traveling in our RVs. The definition of a severe thunderstorm is one producing hail one inch in diameter (quarter sized), or winds of 58 mph or more. According to the National Weather Service (NWS), “Each year across America there are on average 10,000 thunderstorms, 5,000 floods, 1,000 tornadoes, and 6 named hurricanes.” The NWS pointed out that weather disasters lead to about 500 deaths annually. Thunderstorms can produce high winds that can damage property. Thunderstorms can cause flash flooding. 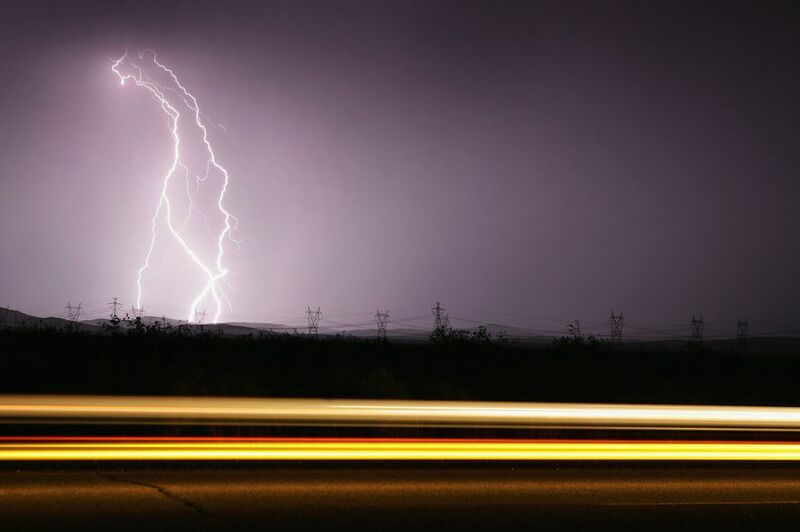 Lightning kills more people annually than tornados or hurricanes. A thunderstorm WATCH means that conditions are right for a thunderstorm to develop in the watch area. Be ready to take cover or evacuate. A thunderstorm WARNING means that a severe thunderstorm has been reported or detected on radar, threatening danger to property or life. Take cover or evacuate if there is time and a safe escape route. Unless you’ve gone RVing in the wilderness, there will be some way to monitor the weather and learn about impending thunderstorms. Cell phones, Internet weather reports, NOAA radios, TV news and weather stations, and local warning systems are just some of the ways we are alerted to weather threats. If you’re staying at an RV park, chances are the park owner or manager will let park guests know when the serious weather is approaching. But it doesn’t hurt to ask when you register about storm or tornado shelters, local warning systems, flood history, escape routes, typical weather, and temperatures, etc. NOAA’s NWS, WeatherBug, Weather.com, and dozens of online weather sites can give you a three- to ten-day forecast. Most RVers like shady sites in the hot summer days. But shade usually comes from trees. Check the trees and shrubs at your site for sturdy branches or ones that might break under high wind conditions. Large branches can cause severe damage to your RV or vehicle, if not injuries to people. If you notice weak branches ask your park owner to trim them. Check your site for chairs, tables, toys, BBQs, and other small objects that can become projectiles in high winds. Bring them inside, tie them down or secure them in some way. Bring your animals inside during any kind of bad weather. Get your emergency preparedness kit out. Make sure your outside storage doors are closed and locked. Retract your awning and make sure it’s securely fastened. Close and latch your windows. If you are going to evacuate, leave early and make sure you are not heading into the storm. The safest place to go during a thunderstorm, if you can’t evacuate, is a basement of a sturdy building. This area will give you the greatest protection from lightning, winds, tornados, and flying objects. The next safest area is an inside room with no windows and plenty of walls between you and the storm. If you don’t have a building to take shelter in, a vehicle (car or truck) is the next safest place. Just keep the windows closed. Like mobile homes, RVs can be blown over in high winds. They’re not the safest place to be. But if you have no alternative, try to stay in a hallway, or at least away from windows and cabinets that can fly open turning their contents into projectiles. If you see lightning or hear thunder, stay inside. Stay inside for about 30 minutes after you hear the last thunderclap. Unplug electronics like TVs, DVDs, computers, coffee pots, etc. Use cell phones and battery powered devices. A battery-powered NOAA radio would be very useful at a time like this. Don’t touch plumbing or metal. Don’t do anything with running water like washing dishes or showering. Both during and after a severe thunderstorm flooding may be a problem. If you are in a low area, move to higher ground. Some RV parks have a flood gauge showing five or six feet above their entry driveway. If you are traveling and come across a flooded roadway, don’t try to drive through it. You could get washed away if the water is moving rapidly. Or, if there are downed power lines in that water, you could be electrocuted. Lightning strikes can split trees, breaking large branches off, and start wildfires. If someone has been struck by lightning, call 911 and start CPR immediately. If you don’t know how to do CPR, please take a moment to learn. The American Heart Association has a “learn CPR in one minute eight seconds” course that teaches CPR well enough that anyone can deliver effective CPR in such an emergency.